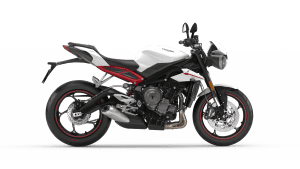 New 2017 Triumph Street Triple 765! 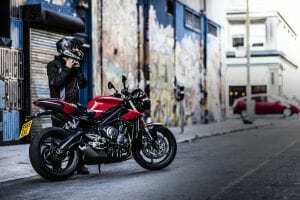 Oh yes, Triumph have finally shown us what we’ve known has been coming for some time now – The new 2017 Triumph Street Triple range! 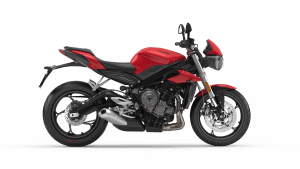 And there’s not just one, but three versions of the larger 765cc naked hustlers available too, begging the question – which one would sir or madam prefer? 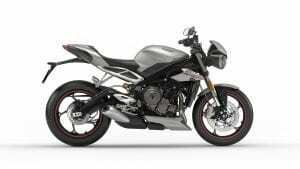 Released this very evening down Londinium way are the Street Triple S, Street Triple R and the top-spec Street Triple RS. Which flavour you choose will of course come down to both budget, and just how much you’re willing to spend to get your hands on the high-spec’ version RS. And if you can’t choose either, the R iterant drops somewhere inbetween said RS and the ecomony version S.
The one we all want – The RS! All three are powered by an uprated, redesigned and larger capacity three-cylinder engine. More than eighty parts are new, including the crank and the Nikasil plated aluminium (increased bore & stroke) barrels. All three versions have different states of tune. The base ‘S’ model produces a claimed 111bhp at the crank, with 73Nm of torque. The ‘R’ hits 116bhp with an extra 4Nm of torque added on, while the ‘RS’ cracks out a 121bhp output married to an identical 77Nm. The R, for some reason, makes its maximum power output at 12,000rpm while the RS makes its 300rpm earlier, meaning there could be some slight engine internal changes, but we’ll find out soon. 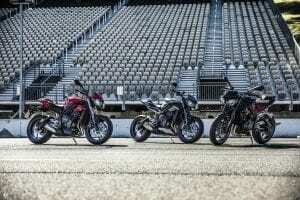 Despite Euro4 restrictions, Triumph have added some much needed go-go to the ST’s go-show. 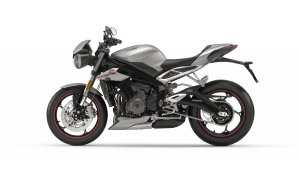 Ensuring you stay tip-top up is a new traction-control system, which on the S can be toggled to match its two rider modes (run by the new ride-by-wire throttle) of ‘road’ and ‘rain’. 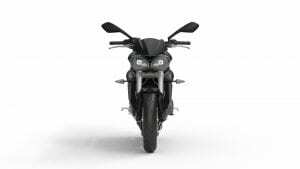 The other two get extra modes to play with, namely ‘track’, ‘sport’ or ‘off’, and there’s also a rider-programmable mode available on those too. 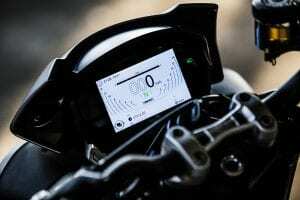 ABS can be switched off on the two R variants, or adjusted for track use via the aforementioned programmable rider mode. Only the RS comes with a quick-shifter (an option for the others), while both Rs get a slipper clutch. Even the ‘economy’ S isn’t shabby! 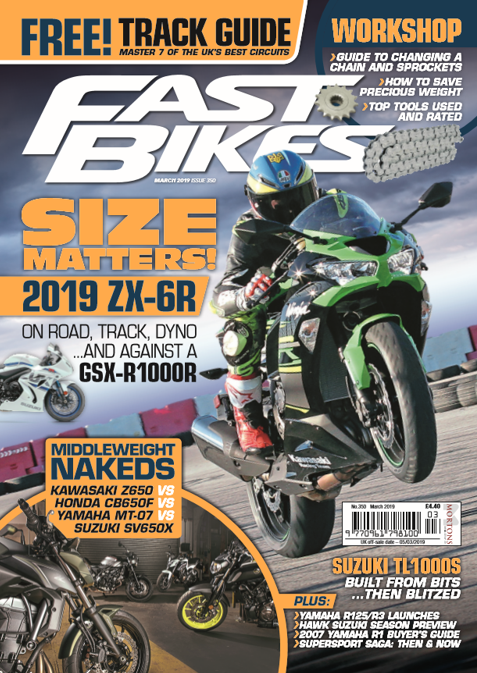 On the chassis side of things there’s a brand new gull style swingarm for all, while the coach-class S brags a 15mm lower seat height to its flashier siblings at 810mm, and has far less sophisticated suspension plus a lazier rake and trail angle. The forks on all three are 41mm units by Showa, but in ascending order of capability. 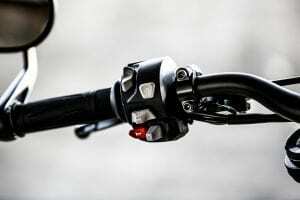 The S has separate function forks (which we think means only one leg actually has a spring inside it) with limited adjustability, as does the R but in a BPF (Big Piston Fork) version this time with the full adjustment gamut available. The RS runs the more traditional fork arrangement, again a 41mm Showa affair but far more sophisticated. They’re joined by a pukka Öhlins STX40 rear shock, while the S and R feature a Showa piggyback unit instead. R we pleased to see you! 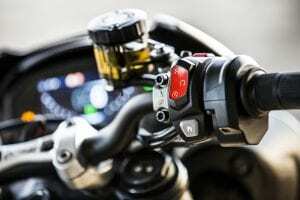 The braking setup is likewise as varied, with old-school Nissin sliding two-piston calipers on the S, more than adequate Brembo M4 32 calipers on the R, and top-rated Brembo M50s items on the RS which is ridiculous on such a small naked bike – but still cool! Other differences are mostly cosmetic and functional, such as the RS and R’s full-colour TFT dash over the more conventional unit on the S. The S also doesn’t have the others’ new and special DRL LED headlamps, but does possess some LED running lights. All of the bikes have the same wheelbase, length and dry weight (166kg) measurements, the S and R have Pirelli Rosso Corsa tyres (the RS the Supercorsa variant), and all three come with their own differing colour schemes. 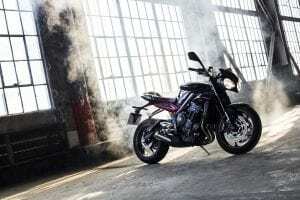 It seems that Triumph have everything in place to wrest back control of the naked middleweight market off Yamaha and MV Agusta, who’s 800cc (or larger) machines finally overtook the legendary Street Triple in dynamic terms during 2016. This is one scrap we can’t wait to dive in to! Next Post:Guy Martin’s 2017 TT Return – With Honda!